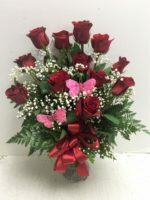 Pamela will choose from the freshest flowers available, such as alstroemeria, carnations, mums and a red rose to create your one-of-a-kind floral arrangement. 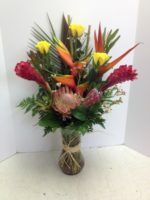 This arrangement can be “spruced” up to be the perfect Christmas gift! When it’s designed for the winter holiday, Pamela will use fragrant winter greens and fresh holiday flowers such as carnations and mums, and then decorate your arrangement with festive berries or balls or bells and more! 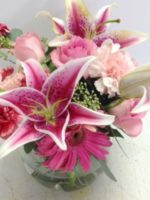 When you choose Pamela’s Designer’s Choice, you are leaving the creation of your beautiful floral arrangement up to Pamela. 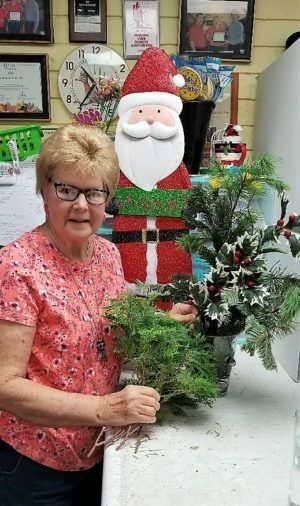 That’s really very smart of you, considering she’s a graduate of Michigan State University Floriculture and has been in the floral industry for more than 50 years! 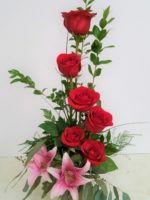 Pamela will choose from the freshest flowers available, such as alstroemeria, carnations, mums and a red rose. 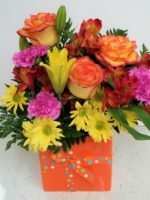 Perfect for mom on Mother’s Day, this is also great for Grandparents Day, Boss’s Day, Secretary’s Day or for a get well, graduation, thank you or birthday. 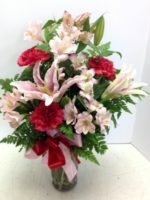 Yes, this arrangement can be “spruced” up to be the perfect Christmas gift! When it’s designed for the winter holiday, Pamela will use fragrant winter greens and fresh holiday flowers such as carnations and mums, and then decorate your arrangement with festive berries or balls or bells and more! 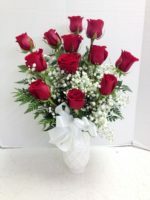 Trusting Pamela with your floral design is easy! You can order her or call us at 602-246-1271 and ask for a unique design by Pamela! You won’t be disappointed! 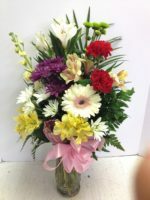 For more options, consider our Mix ’em Up Bouquet or She Loves It!